With 18-year old Joe Gomez already signed, Liverpool are reportedly on the verge of bringing yet another inexperienced young player to Anfield. 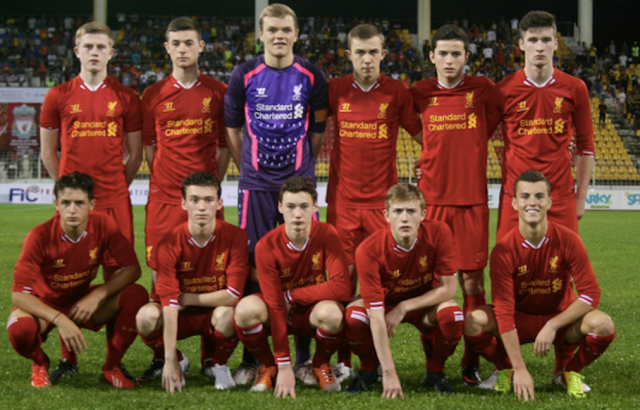 "U.S. teenager Brooks Lennon will sign with Liverpool in the coming days. It marks the end of a rather long courting process between Liverpool and one of the top U.S. national team prospects". * Lennon 'has been training with Liverpool on and off since 2013'. * Strict FA rules on non-EU players have delayed the signing, but Lennon now has an Irish passport en route, which will allow the transfer to take place. "Liverpool are hopeful of getting Home Office clearance to sign Brooks Lennon. The speedy forward from Salt Lake City has already spent time with Liverpool training and on tour but did not qualify for a work permit". "I’ve been in contact with them [Liverpool] the past several months. We’ve been communicating a lot with Liverpool, trying to figure things out with the E.U. passport and a visa"
* Oct 2013: Lennon's initial response to Liverpool's interest: “It feels good when people recognize my talent and my ability. It [a move to Liverpool] is something I dream of"
* Jan 2014: 8-day trip with Liverpool’s U-17 team to Malaysia and Indonesia. Started both matches on the tour, and scored two goals. * July 2014: Scored the winner against Schalke for the Liverpool U17 squad. * Jan 2015: Three goals in two games while on tour with a Liverpool youth side. * 2014-2015: Scored 31 goals for the Real Salt Lake U18 team. Joint top scorer in the Development Academy. * According to TopDrawSoccer: "He [Lennon] is a dynamic player [with] relentless work ethic and quality in the final third...who could fit in on the wing or as a target striker". It's hard to get excited about a 17-year old, and based on historical youth progression at Anfield, he has next to no chance of breaking through into the first-team. That said, if Liverpool's policy is to snap up the best young talent, then getting the best of every age group is a good way to go about it, and with his excellent goal record, it's clear Lennon is a burgeoning talent. Let's hope Lennon doesn't go the way of the Dodo like Mark Pelosi and Villyan Bijev, both of whom ended up on the Anfield extinction list. Jamie, how do you feel about our transfer dealings so far in this window? Ignoring the buys for the future such as Gomez and this Lennon, I finished last season feeling deflated but this summer feels different for some reason. Im excited about this firmino, he strikes me as a neymar type player. If we get rid of 8 and replace them with 6 I feel we have done good business. Add to that a quality striker. I feel the most important position is GK however and it doesn't look like we will address that. How has he got no chance of breaking into the first team? In recent years that has been a strength of this team with both Raheem sterling and Jordan ibe breaking into the first team and becoming top players. This season it's likely that players like Sheyi ojo, Harry Wilson, Jordan rossiter and pedro chirevella will make the step up. He has got a great chance to break into the first team if he proves he's good enough. I love your enternal optomism when it comes to signing youngsters... Write em of before they've even put the shirt on......I have no such qualms about the club signing plenty of young prospects.. They either make the progress and reach the first team, or they get sold for a tidy profit later in the day... win win. Absolutely...I have read some tenuos rumours that Lyon have been offering Lacazette to Arsenal for a measly €21m.... Doubt there is any real truth in this, but if so, we best be throwing our cap into the ring....Giovanni dos Santos, Aumbongybong and Paco Alcacer are some others worth looking at. Well think about risk vs reward. How much does one spend on such a player? £250k to £1mill maybe? Wages of 10 to 30 k a week? Ok by our standards its alot. But if players become marginally successful, good sale on value, nevermind if they become superstars. If 1 in 5 make it somewhat, is it no better than splashing say 20 mill and 70 to 100k a week on a lovren for instance? YAY BROOKS!!!! Woohooo!!!! USA! USA! USA! In fairness, it would be extremely cool to see a Liverpool player with the name Lennon on the back. Imagine the shirt sales off that one. I'd buy 20 personally. Providing Rodgers is gone of course. It's Thierry Henry all over again...no...not Thierry....who was the Russian guy they signed from Zenith for 12 million when the world press were quoting 30 and 40 million quid figured? Arshavin. Would have loved to have had him. Hurt us quite a few times too. WBA in for Lambert apparently. Looks like our striker problem is sorted now!! Very good point about it raising the game of the other youths around them. If all these lads fail then the scouts need sacking. More interestinly I hear LFC might sign some guy from Benfica in January - is this possibly a Swap deal with dead lodd Markovic ?? I might be going mad but.. Is that januzaj on the bottom left hand corner of the pic? Goodness it does look like him...he was being herald as the next best thing last season and all the hype around him has swiftly died down...good player though. The pic has been stretched lengthwise, all of them look like long-headed aliens. Don't know what all the fuss is about Rossiter to be honest. Can we buy the lad and sell him to LA or NYCFC on a inflated value sometime, hopefuly? duh, he is the next Gerrard? My view is based on historical fact, LFC trends, and stone-cold reality. In the entire history of Liverpool FC, no non-British attacker has progressed through the youth system to become a first-team regular. Additionally, the club has made practically zero money from this alleged policy of buying young players and selling them on for a profit. I merely choose to accept the reality - you can continue to stick your head in the sand till your heart's content. Please provide a list of young, non-British attacker's who've been bought by LFC and then sold for a 'tidy profit'. It's just empty words. Having blind faith in a failing youth system (as it pertains to overseas attacking players), doesn't make you a better fan; your blind, unquestioning cheerleader act is damaging, as you're basically condoning a failed system, and not putting pressure on the club to actually achieve actual results. I write these players off for specific, verifiable reasons; I don't just do it blindly, like you with your baseless 'tidy profit' argument. As a comparison: Liverpool haven't won the league for 25 years. Every season, X triumphantly proclaims that the club will win the league, but history proves that it's very unlikely. If X persist with that view in ignorance of the actual reality, it makes X ignorant. A particular strength of Brendan's has been to give the youngsters a chance, something which is often overlooked. Oh My God!! Yeah. Who is that? Got to keep signing the wonder kids when you can, because if just one of them fulfils that criteria it could mean the difference between top four and top spot, well worth the risk IMO. I did mention to Bob that he made a deal with the devil as nothing was said about adding to the name. I think it's almost beyond question now though that BR is staying, as with others - don't know too much about O'Driscoll but hopefully he gets the full support of the fans, but more/or just as importantly the full backing, respect and trust of the players. Whole lot of new faces appearing this Summer that's for sure. yes yes. we get its hard to breaktrough from the academy....Impropable things do happen. our academy has only recently (5-7 years) started increasing the ammount of foreigners. you claim that historically no foreign attacking players have broken trough to first team, isnt even that odd, since the academy has consisted in past, mainly of british players. Until Rodgers comes out and explains why he got rid of Pascoe and why Marsh's contract was not extended and then FSG explain why they have decided to keep Rodgers then I will believe it is true. Liverpool set to reappoint Pako Ayestaran to coaching staff as Brendan Rodgers' new No2. O'Driscoll needs to resign first from the Eng U19's. Still no news on that either. The FA must be hot on his heels if he has gone behind their back without them knowing unless he has already told them he is leaving? Right now all I can say is enjoy the silence. Many rumors but nothing discrete. My gut tells me that the media are merely following the trail of who FSG are considering for the post. For all we know, Pako (and others) have been approached and said no, and O'Driscoll is merely the next man on the shortlist to be "scouted" per say. Not a single enquiry huh? Where did you hear this from? Whatever happens, if Rodgers stays he cannot use anymore excuses of transition and hopefully he would have quit the idea of square pegs should he have escaped the axe. He will have nowhere to hide and for the love of this round earth, hopefully FSG would have ordered a muzzle for him, oh wait, they already have. Couple of things. Reading between the lines regarding the assistant manager. Pure guess, but i think Rodgers has sacked Pascoe/Marsh. If it had been forced on him, I would have thought someone more experienced/higher profile would come in. Amazed if it happens, but Higuain rumours keep coming. You never know how much Reina & Benitez have sold the club. That makes a lot of sense, O'Driscoll does seem like a face that would fit alongside BR though. Also just caught up with other threads and appreciated your answer re Luiz Adriano, I'd not taken the fewer amount of games in his League into account when viewing his appearance stats. Seems like quite a good option for the right money. The fact that the Club has kept the sacking of Pascoe and departure of Marsh a 'secret' is the strangest thing ever? Transistion, with all the new players both from last summer and this one, it would kind of be a fair point, alas I feel he's used up his allotted amount of patience from the majority. So his fourth season into his tenure and close to £300m spent and we want to hear transition? Football has changed since Ferguson started managing at UTD but he did win the FA Cup in his 3rd season with them. I really do not see how on planet earth Rodgers is going to pull off a Ferguson with LFC. That is just that. Like you say football has changed and so have we, but I still think the way to build a consistently successful team is to allow a manger the time to do so and when you take into account all the player changes I think more patience is required. Your name and surname is South African, you from here? At least we will get a manager with pedigree in Klopp. Doubt he is going to want to use phrases such as transition especially when he has won trophies. why i'm getting the vibe its totally german? Could be but both the name and surname is very common over here. wait, you're there too?!!! never knew that, of course you're totally right then. I live in sunny South Africa. Have mentioned it a couple of times. The LFC following over here is MASSIVE! Fair point, Sir and in fact with your above revelation (to me) that you reside in South Africa, I can only sincerely apologise for my past misdemeanours in disagreeing with any/all of your posts. Are you anywhere near Kruger? Google Hillbrow. Many years ago, we are talking the 80's it used to be a very posh area. Come the 90's (Central JHB) It was totally and utterly destroyed. Really?! I mean the skyline doesn't show it, I mean the tower at night. Can't wait to hear "Square pegs round holes" from "Brendan_Rodgers_Biggest_Fan_In_South_Africa"
Mate, take a drive through Hillbrow on new years eve and you will have fridges, furniture and f*ck knows what else flying out of windows, from rooftops etc. My sister and her ex husband had the Privilege of experience it many years back when they got lost while traveling. Some people just have no brain. Club has not said anything or released any news, not one single word. I had to ask you to be sure, couldn't believe my eyeballs when I saw the Google images, wow how sad to see the demise of once great borough. to be honest mate. i agree with you wholeheartedly. i merely come here to encage with the other fans, i dont really rate the articles. sensationalistic pieces more often than not designed to get a certain response. and if you disagree with the writers perception of Reality you are insulted and branded as Ignorant, if you disagree too hard you are censored, often also banned. well every once in a while there is a good piece too. One can always hope mate. I live in a very decent area, big house, massive garden etc and do not want to get political but this country unfortunately is declining very fast and I will leave it there. I might just run into you in Kruger park late this year or early next year, if things go according to plan. Windows up, doors locked! :0 I don't want to be lion poop. Amazing experience though and hope all works out for you! Seems a very worthy addition to anyone's bucket list, although the little research I've done opened a can of worms regarding quite which park was best to visit and the distances involved meant flitting between some of the more recommended ones wasn't practical. Hope you make it there Y.O. Reckon it could well be the much sought after, trip of a lifetime and Logan's kind offer to all his fellow posters for free accommodation and guiding can only be a good thing. Ha ha. If you do pop around to this side of the world, do not forget to visit Mpumalanga. Along the eastern reaches of Mpumalanga lie the Lowveld and the Kruger National Park, and this is a region that must be visited by anyone traveling to South Africa. Pelosi was on the cusp of making the first team for a Europa game until a malicious tackle snapped his leg in half and nearly ended his career. He is still recovering from that injury. So try not to go on like he was a bust. I can't understand it really Jamie, always very pessimistic and negative on here...why bother supporting the club if it makes you so miserable all the time. Hope is what makes us all tune in/show up week in~week out, sure if you base everything on whats happen for the last 25 years we all may as well give up now. Facts and realism are always required no doubt but its seems borderline insulting to the club at times.